Cardinal Vinko Puljic, head of the Church in Bosnia/Herzegovina, has hinted at possible changes to Medjugorje’s status as a sanctuary and place of pilgrimage. In a Christmas interview with press agency Anadolu the Cardinal said Medjugorje is one of the largest confessionals, not only in the Balkans but also in Europe, and should be recognised in some way. 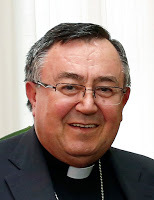 He also spoke about the long-awaited outcome on the status of Medjugorje and said that any decision on the sanctuary would be only a matter of administrative management and for probably the parish, and would not mean an early decision on the claimed apparitions and messages associated with the phenomenon. “In terms of the visions and messages, the Church will continue its study and not go that fast. The Church is not in a hurry,” the Cardinal explained. He added that he was not worried about the attitude of the Holy Father nor of the Congregation for the Doctrine of Faith, but that it was important for the people who come in faith to Medjugorje to pray and strengthen their faith, and return home comforted. The Cardinal’s mention of administrative changes could be the precursor to an official announcement on this from the Holy See.